Wages grew 4.8% from last year, the fastest rate in two years. 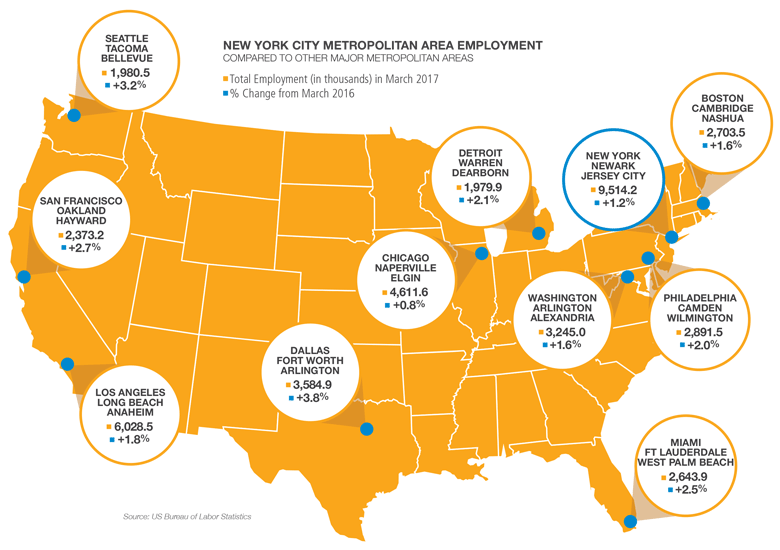 Economic expansion in New York City accelerated in the first quarter of 2017. Residential construction projects in Manhattan surged in April 2017. South Midtown office market continues to strengthen with rising rents and a growing supply of office buildings. Despite sustained tourist visits, transit ridership continued to fall in March 2017. With residential construction on the rise, what do construction trends mean for the New York City economy? And how are women leading this once male-dominated industry? Listen to the podcast to find out! Private sector employment fell in April 2017. The decline of 5,100 jobs reversed last month’s equally sized gains. 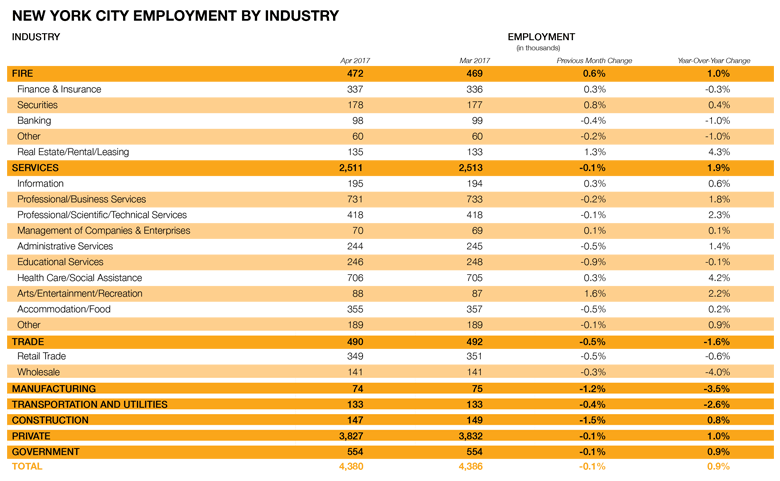 While many sectors saw employment declines, drops were largely concentrated in Education, Construction, and Retail, which accounted for about half of the month’s job losses. Nevertheless, several sectors saw employment growth. The Financial Activities, Health Care, and Arts and Entertainment sectors led job gains. Overall, private employment is 1.0% higher than last year, led by a growing Health Care sector. Wages in April 2017 showed encouraging signs of growth despite employment reversals. Average weekly wages rose to $1,216 in April 2017, a 4.8% increase from the prior year. By comparison, average US weekly wages rose 1.9% to $914. Over the first four months of 2017, hourly wages in the City grew at an accelerating rate. Unemployment ticked up slightly from 4.0% in March 2017 to 4.1% in April. At this time last year, the City’s unemployment rate was 5.2%. This increase is due to job losses and more New Yorkers joining the labor force—in fact, the labor force participation rate rose to an all-time high of 61.3%. By comparison, unemployment was 4.3% in New York State and 4.4% in the US. After subdued economic growth in 2016, New York City saw accelerating economic expansion in the first quarter of 2017, according to an index of economic activity maintained by the New York Federal Reserve Bank (see note below). New York City’s rate of economic expansion has increased for three consecutive quarters and is currently at its fastest rate since the last quarter of 2015. For the US, however, economic growth appears to be slowing, with the first quarter showing the slowest rate of growth since the second quarter of 2015. Note: The CEI is used by the New York Federal Reserve to capture economic activity in a single number, and is constructed from four data series: payroll employment, unemployment rate, average weekly hours worked in manufacturing, and real (inflation-adjusted) earnings. In April 2017, construction started on 312 projects worth $2.7 billion. These figures are 51.4% and 40.2% lower, respectively, than averages over the past twelve months. Nonetheless, April construction starts included 2,023 residential units—a 15.3% increase over the previous twelve-month average. This jump was largely driven by Manhattan, where construction projects accounted for more than one-third of all residential units. This is the largest number of new residential units in the borough since March 2016 and nearly double past twelve months averages. The number and units of construction projects in the other boroughs were subdued relative to recent months. Manhattan commercial office rents were relatively steady in April 2017, rising 0.4% from last year. While rent prices fell in the majority of submarkets, continued strength in the Midtown South market pushed overall rents up. Rents in Midtown South rose 2.7% from last year while the Midtown and Downtown markets fell slightly. The office vacancy rate also rose slightly in Manhattan to 9.5% from 8.9% in April 2016. This increase is attributed to the lack of any new large leases this month, and to two buildings entering the market in Chelsea. New York’s housing market, meanwhile, continued at pace. Rent prices remain relatively unchanged over the last year at $2,330. Sales prices continued to climb, reaching $657,900 in April 2017, 13.5% higher than April 2016. Transit ridership fell in all major categories for the second consecutive month. New York City Transit led declines, which continue to fall to multiyear lows. New York City Bus fell the furthest to 53.5 million riders in March 2017 compared to 58.7 million the previous year. The same appears to be true for automotive traffic with major bridge and tunnel crossings over both the Hudson River and East River recording year-over-year declines. These declines are present despite employment near record highs and a seemingly steady tourism sector. One indicator of local tourism, Broadway revenues, surged in March 2017, largely driven by higher ticket prices and static attendance. Airport passenger traffic, however, saw its first year-over-year drop since February 2014.